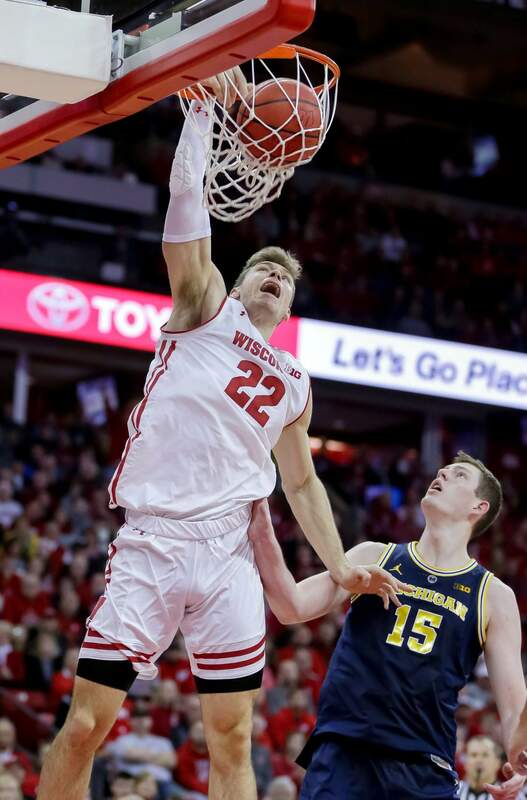 Wisconsin’s Ethan Happ dunks over Michigan’s Jon Teske during the second half of Saturday’s game in Madison, Wis. Happ had a game-high 26 points in Wisconsin’s 64-54 upset victory over No. 2 Michigan. 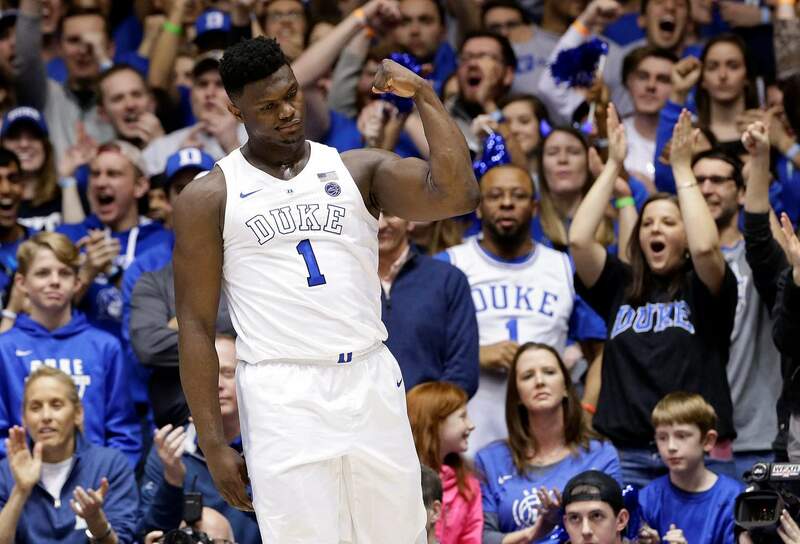 Duke’s Zion Williamson reacts following a basket against Virginia during the first half of Saturday’s game in Durham, N.C.
West Virginia guard James Bolden drives past Kansas guard Devon Dotson during the second half of Saturday’s game in Morgantown, W.Va.
DURHAM, N.C. – RJ Barrett scored 30 points, Zion Williamson had 27 and No. 1 Duke beat No. 4 Virginia 72-70 on Saturday night to give the Cavaliers their first loss of the season. DeAndre Hunter scored 18 points, and Ty Jerome and Kyle Guy had 14 apiece for the Cavaliers (16-1, 4-1), who entered as the nation’s last unbeaten after No. 2 Michigan was upset at Wisconsin earlier in the day. The fourth matchup of top-ranked teams in the sport’s history – Virginia entered at No. 1 in the coaches’ poll – was a tournament-caliber game throughout. There were 14 ties and 15 lead changes, and it was a one-possession game for a 14½-minute stretch of the second half. WISCONSIN 64, NO. 2 MICHIGAN 54MADISON, Wis. – Ethan Happ had 26 points and 10 rebounds, and Wisconsin broke away in the final minute to hand No. 2 Michigan its first loss of the season. Fans rushed the floor after the Badgers (12-6, 4-3 Big Ten) finished off the upset. The Wolverines (17-1, 6-1) closed within 57-54 on Isaiah Livers’ 3-pointer with just under a minute to play. Michigan put on a full-court press that the Badgers broke, and Ignas Brazdeikis was whistled for an intentional foul on Happ, who was across the court from the ball. Happ hit the first shot as an incensed Michigan coach John Beilein argued with the officials, but missed the second. On the ensuing Wisconsin possession, Happ put back his own miss for a 60-54 lead, then hit a streaking Nate Reuvers following a Michigan turnover for a dunk that sealed it. Jon Teske led the Wolverines with 15 points and Jordan Poole added 14. NO. 3 TENNESSEE 71, ALABAMA 68KNOXVILLE, Tenn. – Grant Williams scored 21 points, and No. 3 Tennessee rallied past Alabama for its 12th consecutive win and a chance to climb atop the AP Top 25. NO. 5 GONZAGA 89, PORTLAND 66PORTLAND, Ore. – Rui Hachimura had 17 points and nine rebounds and Gonzaga extended its winning streak to nine games. Zach Norvell Jr. added 14 points. The Bulldogs (18-2, 5-0 WCC) have won 26 consecutive road conference games and have beaten Portland 11 times in a row. Marcus Shaver Jr. had 18 points for the Pilots (7-13, 0-5). They have dropped six consecutive games. WEST VIRGINIA 65, NO. 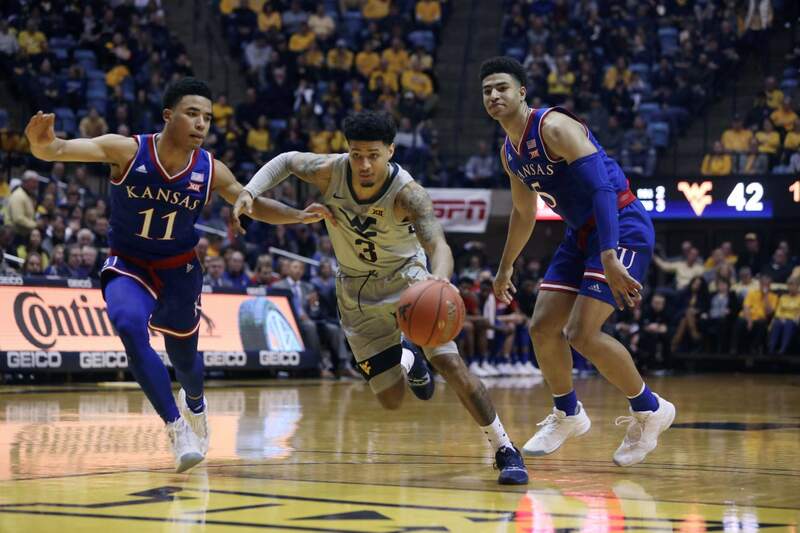 7 KANSAS 64MORGANTOWN, W.Va. – Jermaine Haley hurried up the court and hit a layup with 8.5 seconds left, completing a late rally that lifted West Virginia over No. 7 Kansas. BAYLOR 73, NO. 8 TEXAS TECH 62WACO, Texas – Baylor freshman Jared Butler scored 14 of his 19 points after halftime and the Bears handed the eighth-ranked Red Raiders their second loss in four days. NO. 9 VIRGINIA TECH 87, WAKE FOREST 71BLACKSBURG, Va. – Nickeil Alexander-Walker scored 24 points and No. 9 Virginia Tech used a 14-4 first-half run to pull away from Wake Forest. Ty Outlaw added 14 points and Ahmed Hill 12 for the Hokies (15-2, 4-1 Atlantic Coast Conference). Outlaw, Hill and Justin Robinson each made a 3-pointer during the burst, which turned a 17-all tie into a 31-21 lead with 4 ½ minutes left in the half. The Demon Deacons didn’t get closer than eight the rest of the way. Brandon Childress scored 18 of his 28 points in the second half for Wake Forest (8-9, 1-4). Childress was 7-of-12 from the field and the rest of the team was 11-of-36. NO. 12 KENTUCKY 82, NO. 14 AUBURN 80AUBURN, Ala. – Tyler Herro made two free throws with 24 seconds left and Immanuel Quickley added another to help No. 12 Kentucky survive a big rally from No. 14 Auburn. The Wildcats (14-3, 4-1 Southeastern Conference) rebounded after losing a 17-point second-half lead to finish off a showdown between two of the league’s top teams. Auburn (13-4, 2-2) took an 80-79 lead on Jared Harper’s contested 3-pointer over Ashton Hagans with 32 seconds left. Herro grabbed the lead back from the line, then Harper held onto the ball for what he hoped would be a game-winner. NO. 10 NEVADA 67, AIR FORCE 52RENO, Nev. – Jordan Caroline scored 19 points and Nevada overcame a poor offensive performance to beat Air Force. Trey Porter scored 11 points for Nevada (18-1, 5-1 Mountain West), Caleb Martin added 10 and Caroline and Cody Martin had eight rebounds apiece. Lavelle Scottie led Air Force (7-11, 2-4) with 15 points. NO. 13 NORTH CAROLINA 85, MIAMI 76CORAL GABLES, Fla. – Cameron Johnson scored 22 points, including 3-pointers on consecutive possessions in the closing minutes, and No. 13 North Carolina won a seesaw game. The Tar Heels shot 55 percent, including 9 for 20 from beyond the arc, and showed why they’re ranked second in the nation in rebounds by grabbing a 38-23 advantage on the boards. North Carolina (14-4, 4-1 Atlantic Coast Conference) earned its third road win in the league. The Hurricanes (9-8, 1-4) remained winless in three games against ranked teams this season. NO. 17 NC STATE 77, NOTRE DAME 73SOUTH BEND, Ind. – C.J. Bryce scored 23 points and No. 17 North Carolina State withstood several second-half challenges from Notre Dame. Devon Daniels scored 15 points, including four free throws in the final minute, and Torin Dorn had 13 for the Wolfpack (15-3, 3-2 Atlantic Coast Conference). N.C. State rebounded from a four-point loss Tuesday at Wake Forest. D.J. Funderburk added 11 points. TJ Gibbs hit three free throws and John Mooney dunked on the next possession to get Notre Dame (11-7, 1-4) within 75-73 with 17 seconds left. Daniels answered with two free throws, though, and Gibbs missed a 3 on the next possession with 7 seconds left. NO. 18 MISSISSIPPI 84, ARKANSAS 67OXFORD, Miss. – Breein Tyree scored 22 points, Terence Davis added 18 and No. 18 Mississippi never trailed. Ole Miss (14-3, 4-1 Southeastern Conference) pushed out to an 11-point lead by halftime and had a comfortable advantage through most of the second half. The Rebels had a 40-31 rebounding edge and helped force 17 Arkansas turnovers. Ole Miss has won 11 out of its past 12 games. Arkansas (10-7, 1-4) has lost four consecutive games since winning its conference opener. The Razorbacks were led by Keyshawn Embery-Simpson, who scored 16 points. TEXAS 75, NO. 20 OKLAHOMA 72AUSTIN, Texas – Kerwin Roach II scored 23 points to lead four Texas players in double-figure scoring, and the Longhorns ended a three-game skid with a win over No. 20 Oklahoma. The Sooners (13-5, 2-4) had chances to take the lead or tie in the final seconds but missed three 3-pointers. Matt Coleman III, Dylan Osetkowski and Jaxson Hayes each scored 15 points for Texas (11-7, 3-3 Big 12). Texas was 20-of-25 shooting free throws, with Coleman and Hayes making four over the final 1:04 to give Texas the lead and protect it late. NO. 21 HOUSTON 69, SOUTH FLORIDA 60TAMPA, Fla. – Breaon Brady scored 13 points and Armoni Brooks added 11 to lead No. 21 Houston over South Florida. The Cougars (18-1, 5-1 American Athletic Conference) squandered most of a 16-point second-half lead before pulling away for good over the last 10 minutes. NO. 24 MISSISSIPPI STATE 71, VANDERBILT 55NASHVILLE, Tenn. – Quinndary Weatherspoon scored 17 points and No. 24 Mississippi State never trailed in routing struggling Vanderbilt. The Bulldogs (14-3, 2-2 Southeastern Conference) have won two consecutive games after dropping their first two games to open league play. They needed this victory as the first of back-to-back road games, with four of the next five away from Starkville. PURDUE 70, NO. 25 INDIANA 55WEST LAFAYETTE, Ind. – Carsen Edwards scored 20 points and backcourt mate Nojel Eastern had his first double-double to send Purdue past No. 25 Indiana for the Hoosiers’ fourth consecutive loss. Eastern finished with 10 points and 10 rebounds while locking down Indiana star freshman guard Romeo Langford in this state rivalry. Langford had just four points on 2-of-10 shooting and committed three turnovers. He missed all four of his free throws and was dogged with “overrated” chants most of the game. Both teams are now 12-6 overall, with Purdue (5-2 Big Ten) fourth in the conference and Indiana (3-4) eighth.